Similar to the BlackBerry PlayBook in size, with a passing nod to the upcoming (but still not available in the UK) Amazon Kindle Fire, the ViewPad 7e is not nearly as user-friendly. Some apps, including those from Google, are noticeably not available. At the same time, by offering only the basic smartphone version of Android without many extra frills, the basic mechanics of a tablet are all here: touchscreen display, Android apps, movie playback and ebooks. The ViewSonic ViewPad 7e is certainly better than the clunky, confusing ViewPad 10Pro. 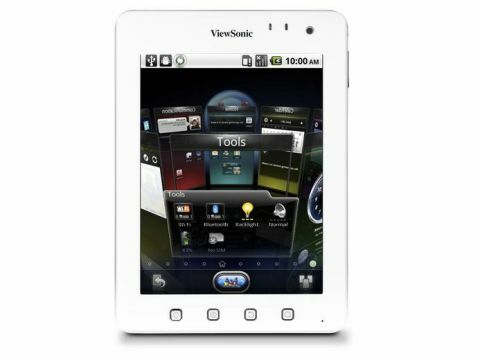 Available only in white, the ViewSonic ViewPad 7e is comfortable to hold in one hand. At 450g, it's stockier and heavier than the 7-inch Samsung Galaxy Tab, which weighs 384g. There's a confusing array of buttons below the screen, with four buttons for Home, Menu, Back and Search. The Home button works in an unexpected way: it doesn't take you to a home screen, but prompts you to pick from the "launcher" or the ViewScene 3D mode. The launcher is the traditional Android home screen where you can place icons and widgets. ViewScene 3D is essentially a widget screen that shows six panels for weather, calendar, or Flickr picts but no app icons. On the upper right-hand side, there's a small power button (it's way too small to find in the dark) and a volume up and down knob that is easy to mistake as a power button. On the top, there's a mini USB port, to be used with the provided USB charger and USB cable, which is odd since every other modern tablet and phone uses a micro USB port. You'll also find a micro HDMI port for connecting the device to an HD TV. Below the screen, you'll find a 3.5mm headphone jack - hard to find, but ideally placed for the dangling cord. To the left of the device, there's a microSD slot for adding cards up to 32GB each. The ViewSonic ViewPad 7e uses an ARM A8 1GHz processor, has 512MB of RAM, 4GB of internal storage and supports Wi-Fi (including 802.11n) and Bluetooth 2.1. The front-facing webcam is only 0.3MP and the rear camera is only MP - both far below the specs of most recent tablets. Because the 7-inch tablet is so small, measuring 192 x 131 x 14.1mm, there isn't much space for the 3300mAh battery, which lasts only five hours. Still, the Samsung Galaxy Tab lasts for seven hours. The LCD touchscreen has a 500:1 contrast ratio, which looked dim and even hard to see in bright light compared to the much brighter screens used on other tablets. It's not ideal for watching movies. But did we mention the £150 price tag? That's the one redeeming feature. Unfortunately, when the Kindle Fire arrives in the UK, it will be priced similarly. And, the BlackBerry PlayBook has a similar holiday price point for now. There's also the nagging sense that a 10-inch tablet isn't that much more expensive.